If you live in California and spend any time listening to commercial radio or television, you have heard a lot about Prop 29 on the June ballot. Or, to be more accurate, you have been inundated with commercials primarily funded by Phillip Morris Tobacco Co. against Prop 29, the California Cancer Research Act. Backed by the American Cancer Society, Prop 29 imposes a $1 excise on tobacco products that would generate $855 million for medical research on smoking-related illnesses in its first year. It also strengthens California’s smoking prevention programs. But for the massively funded No on 29 campaign, Prop 29 is not about making Californians healthier. Instead, No on 29 is a case study for how corporations battle initiatives by associating them with generic ideas many voters hate – unfair taxes, bureaucratic decision-making, initiatives that claim to be about one thing but really do something else – so that voters will reject Prop 29 without even knowing what it is about. I listen to a lot of San Francisco Giants games on the radio, which means I have been deluged with ads for No on 29. And because there are few hotly contested or heavily funded issues on the state ballot, the Phillip Morris-funded No on 29 campaign seems to have the airwaves all to itself. I always support increased taxes on cigarettes because they are addictive devices that kill people. But I recognize the argument that these are regressive measures that disproportionately fall on the poor (who smoke in far greater numbers). Phillip Morris, however, does not trust voters to reject Prop 29 on the merits. Its campaign avoids any of the valid claims that could be made against Prop 29 in favor of generic arguments that could be made about initiatives that have nothing to do with health or smoking. Among these arguments is that Prop 29 seems like a good thing, but it’s not what you think. This testimony is given by a physician/actor who would presumably care most about people’s health. Few ballot initiatives can escape this line of attack. Of course, had the measure required all money to be spent in California, opponents would have attacked it as funding “special interests” in the state while depriving the world’s best and brightest researchers from helping California. That’s the genius of No on 29-style generic campaigns: you have arguments that can be used regardless of what the measure says. Opponents also claim Prop 29 creates “a new unaccountable state bureaucracy filled with political appointees.” Voters hate “bureaucrats,” and also dislike the idea that California money is being spent out of state. 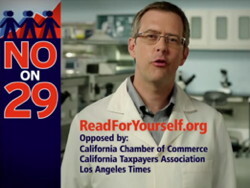 Prop 29 had to include a mechanism for spending money – it creates a nine-member body including “representatives of national disease advocacy groups,” which presumably could mean people not from California – and if no such body had been created, the measure would be attacked for lacking a body to distribute the new funds. That’s absolutely correct. Prop 29 also fails to provide money for AIDS research, public transit, affordable housing and other pressing needs. This is the classic strategy of focusing not on the problems an initiative intends to solve, but rather on what it does not do. And had Prop 29 allocated money to anything outside tobacco-related health, the No campaign would have argued that the measure claims to focus on health but instead spends money elsewhere. In a tribute to the success of the generic No campaign, a Public Policy Institute poll released May 23 found support for Proposition 29 dropping 14 points among likely voters since March. Today, the yes side leads 53-42 percent, when in March it was 67-30 percent. Voters by a 63-34% percent margin say they support tax increases on cigarettes, confirming that Phillip Morris made the right move in using generic anti-initiative arguments rather than challenging Prop 29’s goals. If this trend continues, expect Prop 29 to lose.